Helen Humes passed away on March 27, 2018 while living at the Ventura Townhouse Assisted Living in Ventura, CA. She is survived by a daughter, son, three grandchildren and three great grandchildren. Although not a native of California she happily resided here for many years. She was best known for her wonderful porcelain art talent and practiced her art for over sixty years, publishing over 18 books and numerous articles on porcelain painting. She also created gift lines of cards, gift books and porcelain jewelry which her followers eagerly purchased throughout the years. She created a business with porcelain art, taught classes at her home and at Burbank Adult School for many years and when moving into assisted living, had a private studio where she continued to paint and create one of a kind pieces for many years. She and Ray, her husband travelled throughout the U.S., England, Australia and New Zealand so that Helen could offer classes to the many students who were eagerly awaiting her teaching. She also started a china painting school in Santa Barbara where students could come and study in the summer. She had a vigorous business for many years with her husband at her side as her business manager. Her husband passed away in 2001; Helen continued on with her art until early 2015 when health issues made it impossible to continue china painting. Local china painting artists still came to visit her and share their current projects with her and ask for guidance about current projects at the ripe old age of 97. Helen was very generous with her time in assisting these artists and was always willing to mentor promising artists when they approached her. Helen’s parents were from Scotland and came to the US early in the 1900’s. She maintained contact with her family in Scotland and she and Ray made several trips to visit family and friends in the “old country.” Scotland held a very special place in her heart because of this. 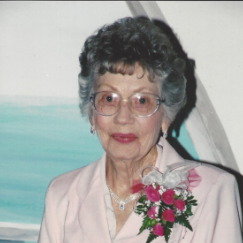 Helen exhibited a strong Christian Faith which she treasured throughout her life and which carried her into the presence of her Savior, Jesus Christ on March 27th. She and her art advice will be sorely missed by her family and in the porcelain artist world. A memorial service was held at the Chapel City Church in Camarillo on April 14, 2018.